DataCore announced a new world record for price-performance using the industry’s most recognized and peer reviewed storage benchmark, the Storage Performance Council’s SPC-1. Thanks largely to breakthroughs in its parallel I/O software that harnesses the untapped power of multi-core processors, this achievement places DataCore with an audited SPC-1 Price-Performance of $0.08 per SPC-1 IOPS and as the clear-cut leader in SPC-1 Price-Performance overall. DataCore certified its results on a powerful but compact 2U Lenovo System x3650 M5 multi-core server featuring Intel Xeon E5-2600 v3 series processors with a mix of flash SSD and disk storage. 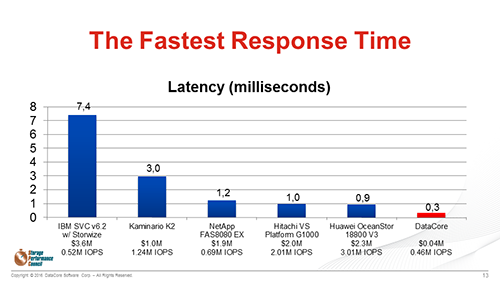 On this same platform, DataCore also recorded the fastest response times ever attained, even compared to the many all-flash arrays and multi-million dollar name brand systems that have published SPC-1 results. Notably, the record-breaking price-performance results were achieved on a hyper-converged solution capable of servicing both enterprise-class storage requirements and demanding database and transaction processing application workloads – all running together on the same platform. Hyper-converged systems must demonstrate that they can cost-efficiently handle combined enterprise-class storage and application workloads. Unlike SPC-1 results that characterize only external storage systems excluding the servers used to generate the load, DataCore’s $0.08 per SPC-1 IOPS result includes the cost to generate the workload and, therefore, encompasses the total cost and end-to-end requirements for running the enterprise application. 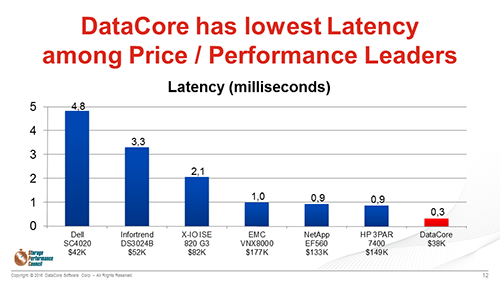 For the benchmark, DataCore used an off-the-shelf, hyper-converged system targeting enterprise-class OLTP and latency-sensitive database applications rated for 459,290.87 SPC-1 IOPS, with a total cost for hardware, software and three years of support coming in at $38,400.29, making it the top SPC-1 Price-Performance result of $0.08 per SPC-1 IOPS™. That is a 300% improvement over the previous record of $0.24 per SPC-1 IOPS attained by the Infortrend EonStor DS 3024B and less than 25% of the cost of popular top-of-the-line storage arrays including EMC VNX 8000 , NetApp EF560 All Flash Array, Dell Storage SC4020 , and HP 3PAR StoreServ 7400 . DataCore and IBM are the only companies to benchmark a hyper-converged system where the SPC-1 applications and storage workloads they generate are both serviced on the same platform. This means that DataCore’s $38,400.29 price includes not only the storage components, but all of the host server resources and the hypervisor software needed to run the enterprise-level database/OLTP workloads generated by the benchmark. For comparison, the only other hyper-converged system with publicly reported SPC-1 results is an IBM Power 780 Server. 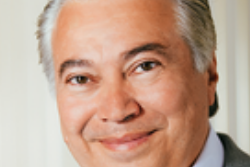 Their SPC-1 Price-Performance result is $4.56 per SPC-1 IOPS . That system attained 780,081.02 SPC-1 IOPS at a total price of $3,557,709.00, or roughly 91 times more costly than the DataCore solution. The remarkable price-performance ratings can be attributed in major part to DataCore Adaptive Parallel I/O techniques intrinsic to the design of the SANsymphony-V Software-Defined Storage Services platform. 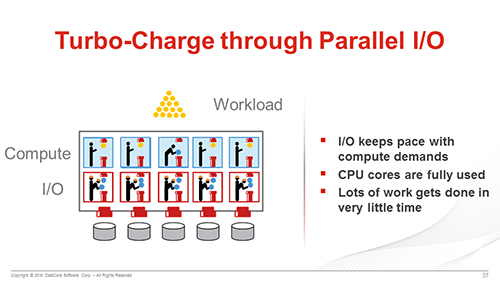 DataCore executes many independent I/O streams simultaneously across multiple CPU cores, significantly reducing the latency to service and process I/Os by taking full advantage of cost-effective but dense, multi-core servers such as the Lenovo System X machines. 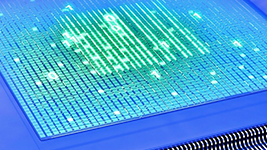 Competing products serialize I/O limiting their throughput and slowing their response times. The rigorous SPC-1 performance testing is designed to demonstrate a system’s performance capabilities for business-critical enterprise-level workloads typically found in database and transaction processing environments. The audited configuration that was tested and priced includes DataCore SANsymphony-V parallel I/O software on a Lenovo System x3650 M5 multi-core server featuring Intel Xeon E5-2600 v3 series processors running Microsoft Windows Server, equipped with 16 SSDs and 8 hard disk drives. The DataCore software also supports Microsoft Hyper-V, VMware ESXi, Linux KVM and other hypervisor- based solutions. It can also run directly on Windows servers when server virtualization is not appropriate. DataCore SANsymphony-V software dramatically reduces the I/O limitations and bottlenecks that restrict the number of virtual machines (VMs) and workloads that can be consolidated on server and hyper-converged platforms. The software enables industry-standard x86 servers to gain the essential storage functionality needed to meet today’s demanding tier-1 business application requirements. It runs on off-the-shelf servers and works infrastructure-wide across all types of storage (flash, disk and cloud) to automate and optimize performance and resource allocation.